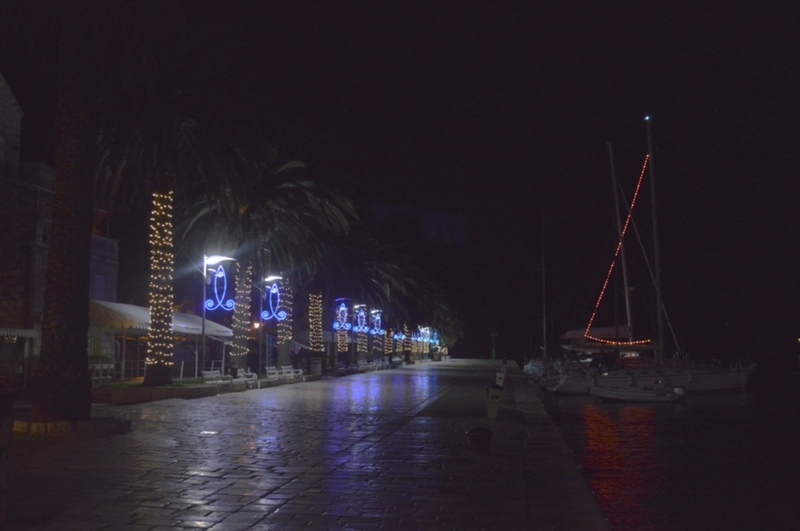 Ringing in the New Year takes on a slightly different twist in Hvar. The entire evening is punctuated with loud cracks and BANGS that fairly resound around the old stone square. The local lads – young and not so young – were having fun throwing firecrackers at their friends, recreating the effect of some 16th century battle with noise and smoke. My ears were certainly ringing all night! 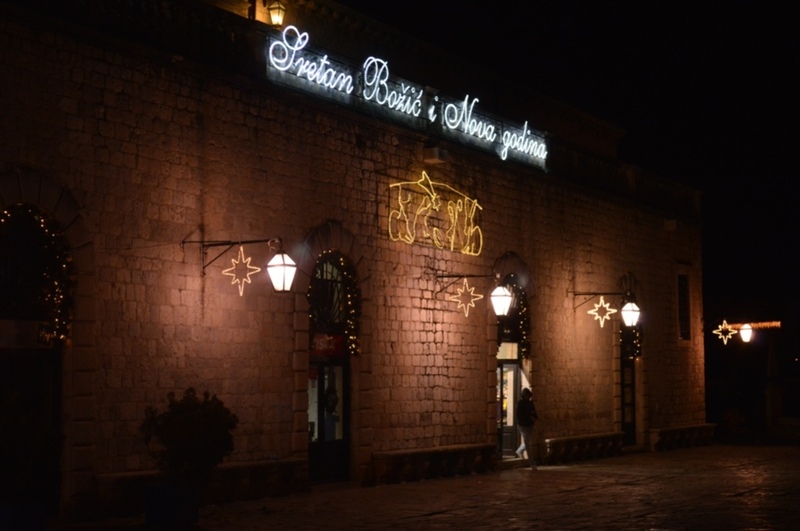 We’d gone into Hvar for the New Year’s party, as there was to be live music in front of the Loggia. We thought to go in early and get some dinner first, and we headed for the Park Bar for drinks and some of their excellent canapés. 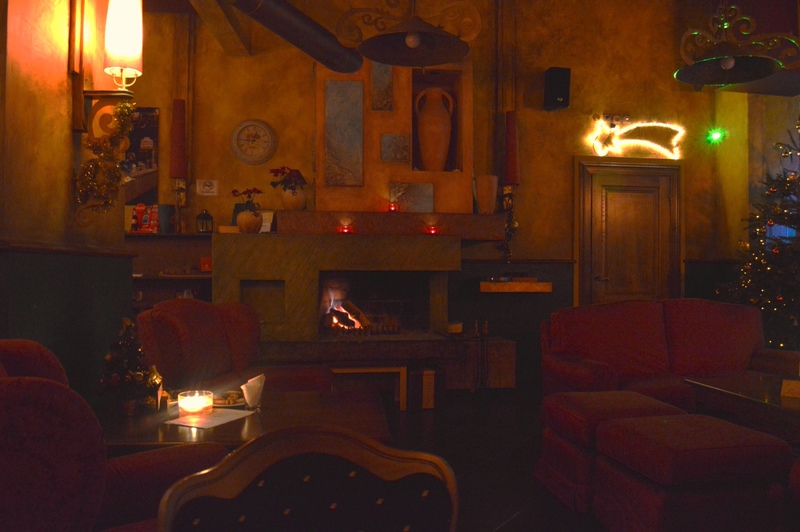 It’s a lovely cosy place at this time of year, with big comfy sofas and a blazing wood fire. Their mulled wine was very warming, and after a while we went in search of some dinner. Well, it seems that food offerings were not part of the evening’s entertainment. Many of the smaller, more casual dining places were dark and shuttered, even Miserola pizzeria on the main square was disappointingly closed by 10pm. Cafes and bars were all open, of course, and we could probably have got pastries, but we’d been looking forward to pizza. Oh well. 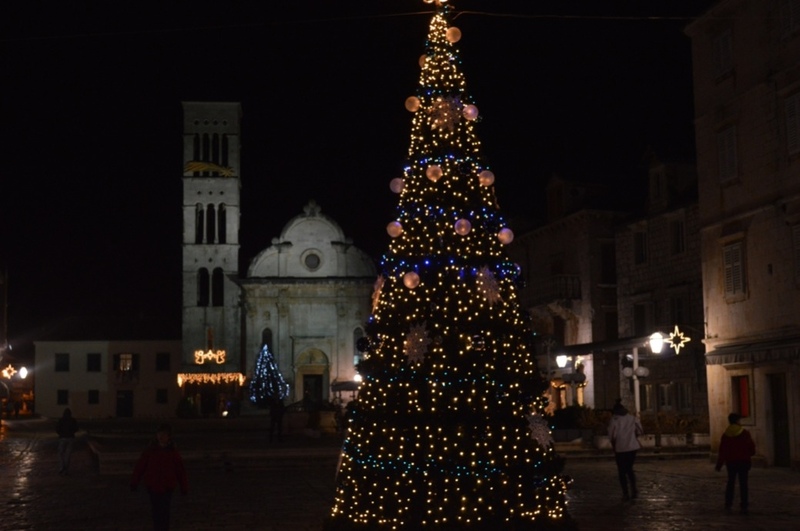 We wandered along the waterfront to enjoy the lights, then took to the maze of dark side streets in search of Nonica’s slastičarna, which apparently makes the best cakes on the island. I’m sure it’s easier to find in the daylight when it’s actually open for business, but the search up and down the steps of backstreet Hvar certainly warmed us up. Back on the main square, the band seemed to be testing the audio equipment Hey, hey, hey, beautiful Sundaaaaaaay, etc. OK, good, we have some progress. In typical fashion, a show that is due to start at 10 is nowhere near ready yet, and it’s already 10:15. Back to the Park Bar for more drinks, we sit outside and watch the firecracker battle in the nearby park. The music on the main stage finally got going around 10:45, and we moved over to watch the activities. 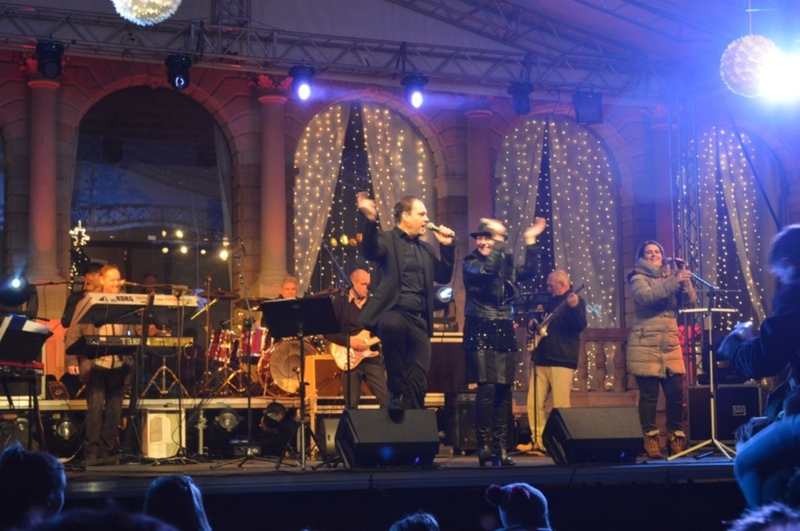 The band turned out to be pretty good, and the main headline singers – Alen Nižetić and Zorica Kondža – excellent. I’m not at all knowledgeable about Croatian popular music, but clearly everyone else knew the words of the songs. 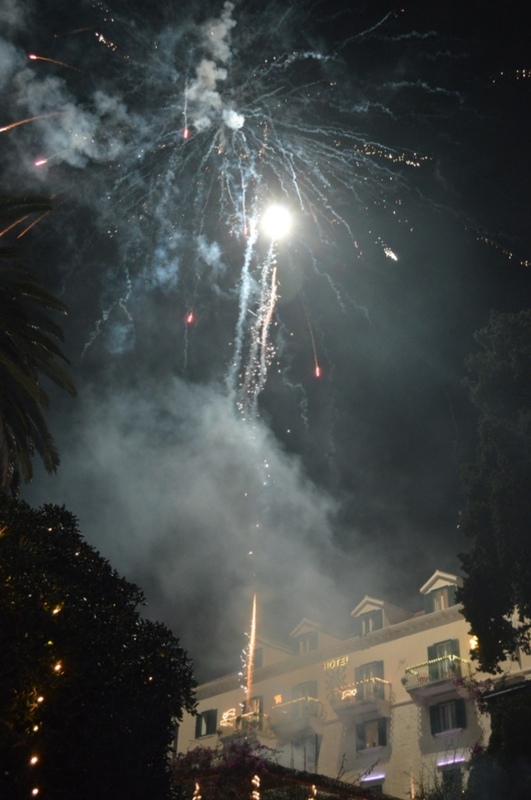 The evening so far had been all about the boys and their firecrackers, but now parties of girls were in evidence with long legs and high heeled boots. They started to collect round the stage, dancing away. How much more civilized girls are! I really enjoyed Alen Nižetic, great voice and very catchy songs though the words mostly escaped me. I understand that the rap was particularly clever, and we all joined in the chorus part. Good fun. As he handed the mike over to Zorica Kondža for her first set, I was amazed to see the girls displaced by a surge of young men getting closer to the stage to hear her. Fascinating! With the guys came more firecrackers and we had to keep a wary eye out for the over-exuberant types lobbing them at the feet of the crowd. 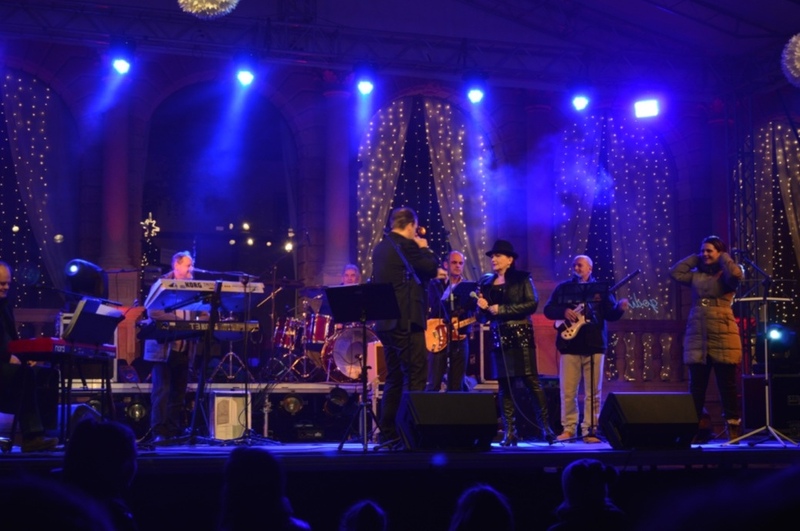 Zorica Kondža turns out to be a very well-known singer from Split, part of the Croatian music scene from the 1970s on. A very versatile singer, she combines a folksy mediterranean style with soul, blues and rock. 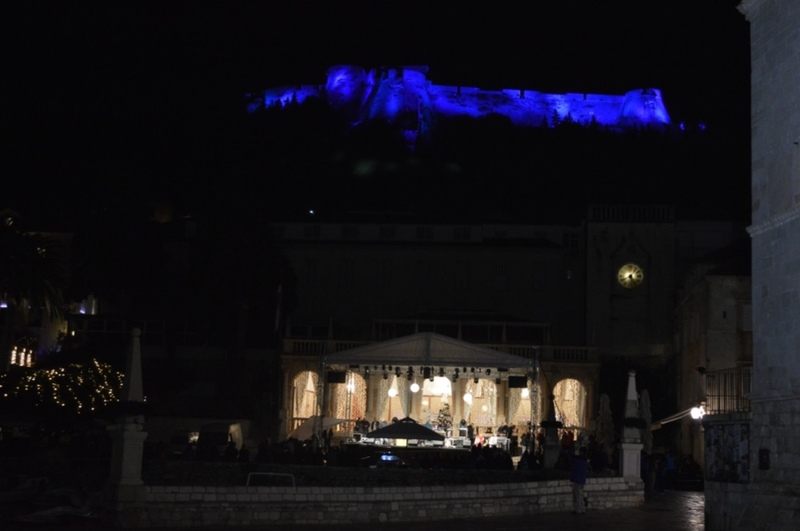 Alen Nižetić is also from Split, composing and singing his own work bringing Dalmatian style right up to date. Will have to investigate these singers further! At midnight we were treated to a real fireworks display, the kind I like with pretty colours and flashing lights. 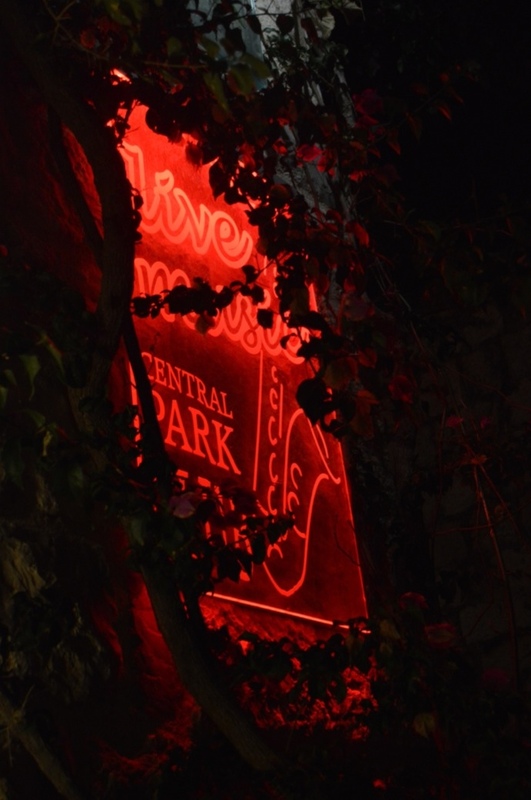 It’s a lovely setting for it, and a great place for a party, even in the depths of winter. There was a pretty good crowd by now, all enjoying the music. And more were still arriving, knowing as we had not, that the party really only begins at midnight. Happy New Year to one and all, and may 2014 bring you health and happiness and whatever else you may wish for!